Zangdokpalri (Tib. ཟངས་མདོག་དཔལ་རི་, Wyl. zangs mdog dpal ri) — the Copper-Coloured Mountain of Glory is the pure land where Guru Rinpoche now dwells, said to be located in Ngayab Ling. On the peak of the Copper-Coloured Mountain, Padmasambhava liberated the king of the rakshasas, Raksha Thötreng, and assumed his form. Now he dwells in Zangdokpalri as a ‘vidyadhara of spontaneous presence,’ the fourth vidyadhara level. 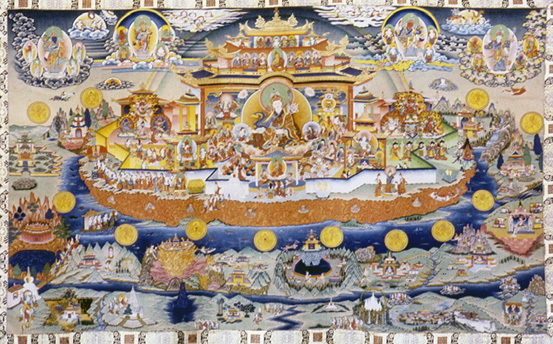 “There,” writes Kyabjé Dudjom Rinpoche, "he manifested the inconceivable Palace of Lotus Light, and presides as king, with one of his emanations in each of the eight continents of the rakshasas, giving teachings like the Eight Great Methods of Attainment of the Kagyé, and protecting the people of this world of Jambudvipa from fears for their life. Even to this day, he reigns as the regent of Vajradhara, the ‘vidyadhara of spontaneous accomplishment of the ultimate path’; and thus he will remain, without ever moving, until the end of the universe."